From the misty parapets of Welkin Heights, Teo and his angel kids peered earthward, past Valhalla and Olympus, beyond the fields of Elysium and Arcadia, and other afterlife abodes of gods and souls of man. They focused on a small cottage nestled comfortably in an isolated greenwood vale, specifically on the banks of a nearby brook. There sat a barefoot peasant girl, with tousled hair and tattered dress, and a most unbecoming scowl. She was grumbling to herself, or rather, grumbling at another sharing the bank. It was a porcupine, and she was ordering it to back off. 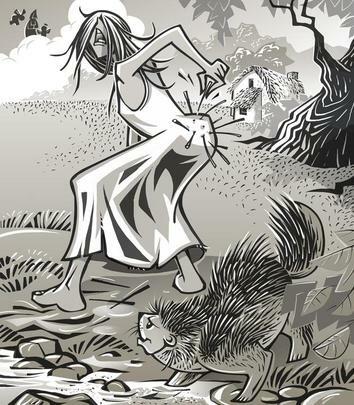 The porcupine must not have felt like leaving, and emphatically expressed his point. Muffled laughter from above. Shana looked up at the clouds, shook her fist … and was just about ready to fade right back out of this prickly situation. “Don't even think about it!” Teo said. “I've none to tally yet!” She grimaced while extracting another quill.